In my early twenties I built windsurf boards with a friend of mine, Ole. Ole is a structural engineer and his background had a big impact on the way we built. Apart from shape, the basic mantra was as light and stiff as possible. Surfboards are typically built around a foam core onto which several layers of glassfiber is laminated. What we ended up doing was, to cut the core straight down the middle, hollow out each half and then glue it back together again. On the out side it would look like any other board, but on the inside holes would run across the entire board from the nose to the tail. This was a fairly labor intensive process but it paid off. We managed to make them about 8 or 9% lighter than had we not hollowed them out. 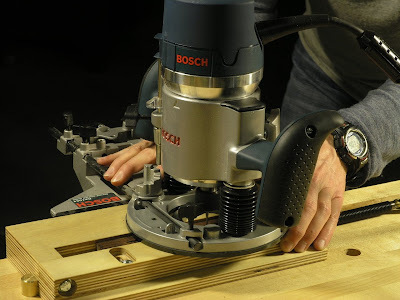 It produced incredibly responsive boards; quick planing, fast and easy to maneuver. A while back I read an article by Ervin Somogyi where he explained that a heavier bridge would increase sustain but have a slower response and lower volume, while a lighter bridge would have the opposite characteristics. 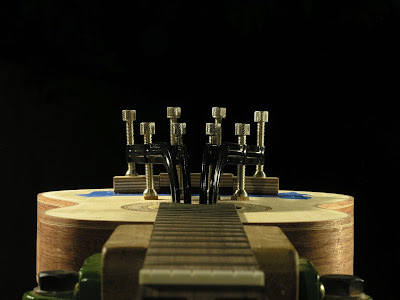 I have also read about builders that experimented by adding weights to the bridge and various places of the soundboard in order to bring out a certain sound. 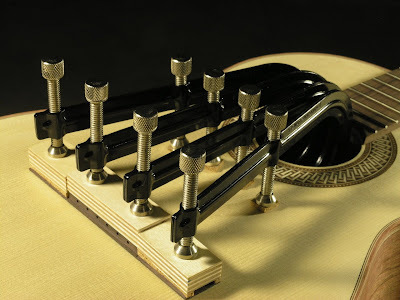 One could argue that the 'optimal' classical guitar sounds a certain way exactly because of the traditional bridge design is the way it is, and monkeying with that will produce a less desirable sound quality even though it might be louder and more responsive. While that certainly may be the case, I couldn't help but think that maybe, like our surfboards, the guitar could benefit from having a light bridge regardless. 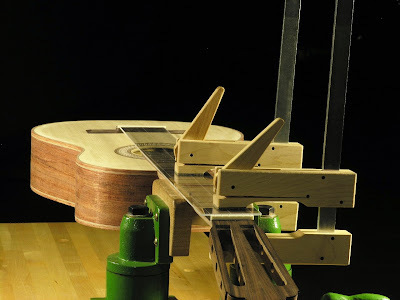 After all, much effort goes into maximizing the stiffness to weight ratio of the soundboard as it is, so why not extend that to include the bridge. Off I went. Like the fingerboard the bridge blank was first cut out to a slightly oversized blank on the bandsaw. 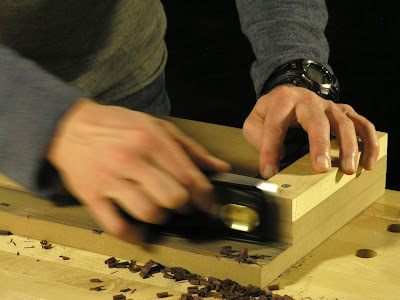 However, this time both edges and ends were trued to exact measurements, 25mmx165mm, with a low angle block plane. At this stage I weighed the blank and it came out to be 37.2 grams. As with the fingerboard I had to be very careful to avoid tear-out. Next a slight concave was scraped into the bottom of the blank, matching the dome of the soundboard. This was done by 'eye'. I had taped a piece of 150 grit sand paper to the soundboard and used that to scratch the gluing surface of the blank, as a guide to where more scraping was needed. This was done until the whole gluing surface of the blank got evenly covered with scratch marks. These scratch marks were cleaned up with a few light strokes by the scraper. 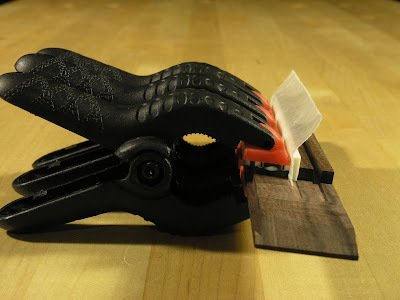 Some people advocate roughing up the gluing surface with coarse sandpaper, to create better bonding gluing surface. 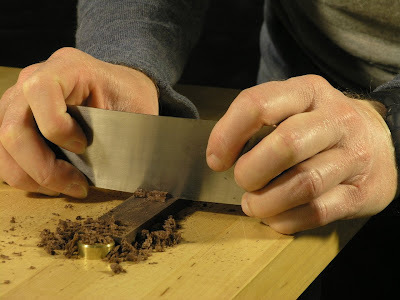 I've even seen people using a Stanley knife to cut marks in the bottom. I don't really agree with that practice. In my book the cleaner and smoother the gluing surface the better. Each to their own. Next up were the sting holes. 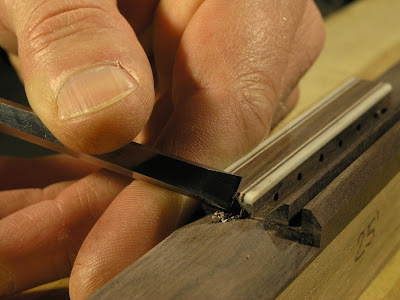 The string spacing at the bridge for this small instrument is only 10mm, making them span 50mm altogether. It's not much, but should fit a child's hand well. As there was going to be a little 2mm high string shelf built into the bridge to protect the soundboard, the holes were drilled slightly higher on the side to end up in the centered between the shelf and the top. To counter this the holes were angle downwards too to increase the string break angle. I clamped a 1x2" piece of oak to my drill press as a fence, and added a 1mm spacer to the bottom of it to achieve the desired angle. 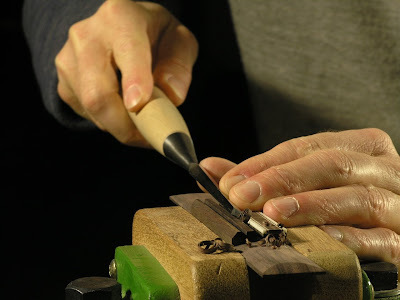 In order to keep the bit straight as possible while going through the work, I did the drilling in many steps, going a little bit deeper each time. This worked really well and kept the bit from getting clogged up and wandering. A 5/64" brad point bit was used for this. 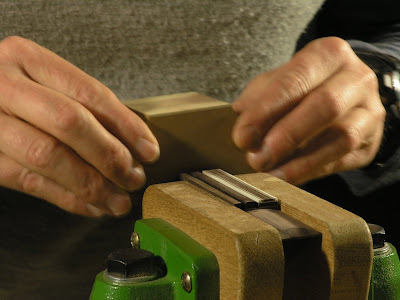 This procedure was started by marking up the tie-block and making two preliminary cuts across the blank with a dovetail saw, indicating the location of the tie-block. 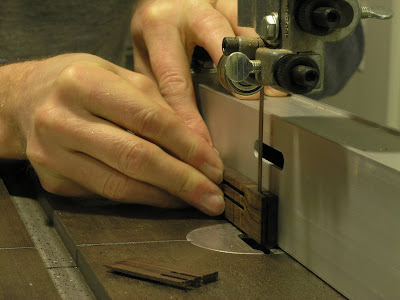 I had attached a thin piece of maple with some spring clamps that functioned as a simple depth stop, keeping the cut from going deeper than the thickness of the wings. 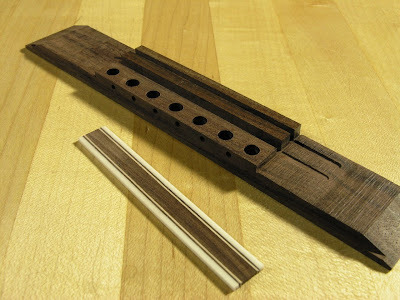 To route the slots for the saddle and the string trough, I made a jig based on the one shown in Roy Courtnall's book. I modified Courtnall's version by making a kind of shelf onto which the bridge rested upon. 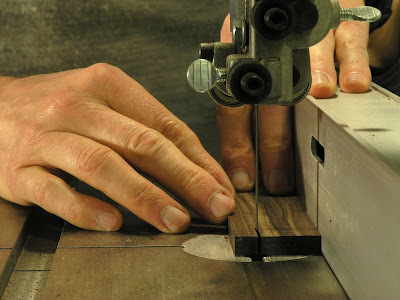 The shelf slit into the main body of the jig and could be tightened and locked in place by four hex screws. This modification will enabled me to use it for a wider range of bridge sizes and shapes in future. 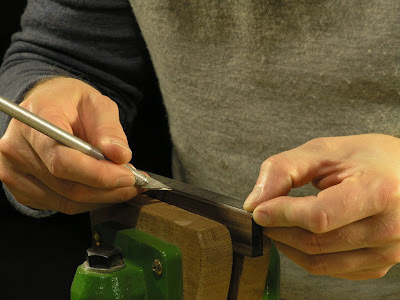 Both the saddle slot and the string trough were routed in three goes to a total depth of about 5.5mm, 7/32", leaving about 3mm or 1/8" of solid wood under the saddles. I had to go a little deeper on the string trough to expose the string holes fully. This was done with the width of the tie block as it would cut into the top of the wings otherwise. I used a 1/8" downcut spiral bit for both slots. 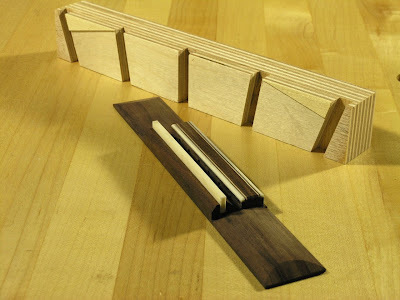 The little string shelf was done by planing a small rebate with a shoulder plane. 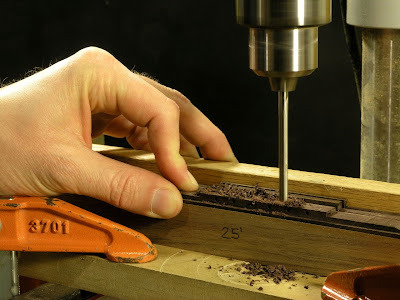 By placing a 2mm thick piece of scrap from one of the sides under the plane I just went at it until the the desired depth of 2mm was achieved. It was slow work but doable. 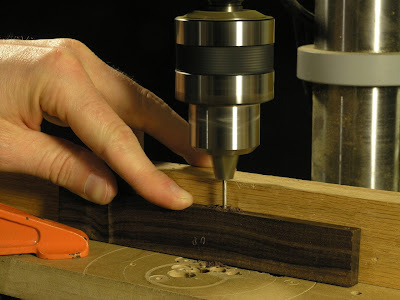 If I'd had a router table at my disposal that would definitely have been an easier and faster way to do it, but I didn't. Next time around! Then the waste above the wings were trimmed on the bandsaw and last the bevels at the end of the wings were cut as a miter using my shooting board and the miter jig I made for the rosette log. 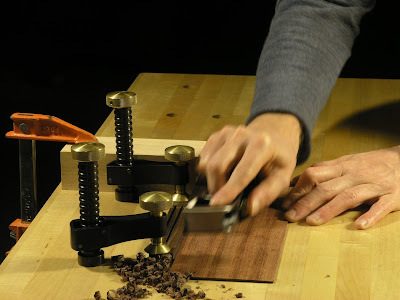 The shooting was done with my low-angle jack plane. As I mentioned above, I wanted to try and make my bridge lighter. One obvious place to start was by hollowing out the tie block and so I did. I figured that with a 10mm string spacing and 2mm string holes I had 8mm to play with, but as this was my first go at it ,I decided stay on the conservative side of thing. I calculated that using a 3/16" drill bit would give me a wall of roughly 1/16" thickness between the chamber and the string hole, This I reckoned would leave amble strength in the bridge. Ole later confirmed this and recommended I could go thinner next time with out problems if I wanted to. First the tie-block height was reduced about 1mm to accommodate for the cap that eventually as going to cover the holes. Then the holes were marked slightly offset towards the back as I wanted a bit of strength to the front of the tie block where the strings are pulling upwards as they bend over the saddle. 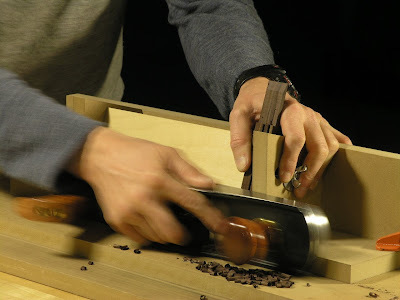 The holes were drilled through the tie block leaving only about 1mm of wood at the bottom. I weighed the bridge before and after the drilling and found that I had managed to reduce the weight only a mere 0.7 grams from 21 to 20.3 grams. I was a little disappointed with this, though it turned out that the final bridge weight of 18.7 grams had been reduced by almost 4% which was not really that bad. Had I gone with a 1/4" bit instead I'd be able to get that number up to over 7% instead. The tie block cap was made from a 2mm thick piece of scrap I had left over from the bridge stock. As the total width of the tie-block was 10mm, I calculated the center wood strip would be around 4.5mm or 3/16", Leaving space for the two bone pieces each 1.6mm or 1/16", and 4 contrasting veneer lines of a total of 2.4 mm, roughly 3/32". 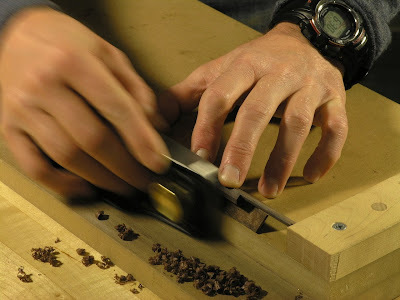 The wood center was trimmed to size with a block plane. Then the cap was glued together with the veneer lines and bone pieces. 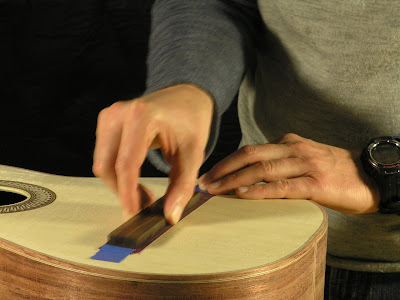 I didn't take any photos of this, but basically it was done in a similar fashion to my backs and soundboards; by clamping them from the side and top at the same time. From the side to glue them together and from the top to keep it all flat. Once it was all dry I thinned cap to about 1mm and trimmed the width and length to fit the tie block accurately. I prepared a bone piece to fit snug into the string trough, it will later become the saddle, and used it as a stop to fit the cap up against. Then glue was added to the tie-block and the cap was carefully clamped on with three 1" spring clamps. The clamps were positioned so if any movement was to happen it would be towards the bone piece. The bone piece was covered in wax paper to protect it against squeezed out glue. The rough shape of the wings were done with a file. Again, here I used facets to control the progress and symmetry, by first working in a primary bevel then two secondary bevels. Once I was getting close to the final shape I switched to sanding. I made a radiused sanding block for this. By knowing that the wings were 25mm wide and 4mm high minus a 1mm edge, making the peak of the arch 3mm high, I calculated the radius of the arch to be just over 27.5mm making the diameter somewhere between 2 1/8" and 2 1/4". 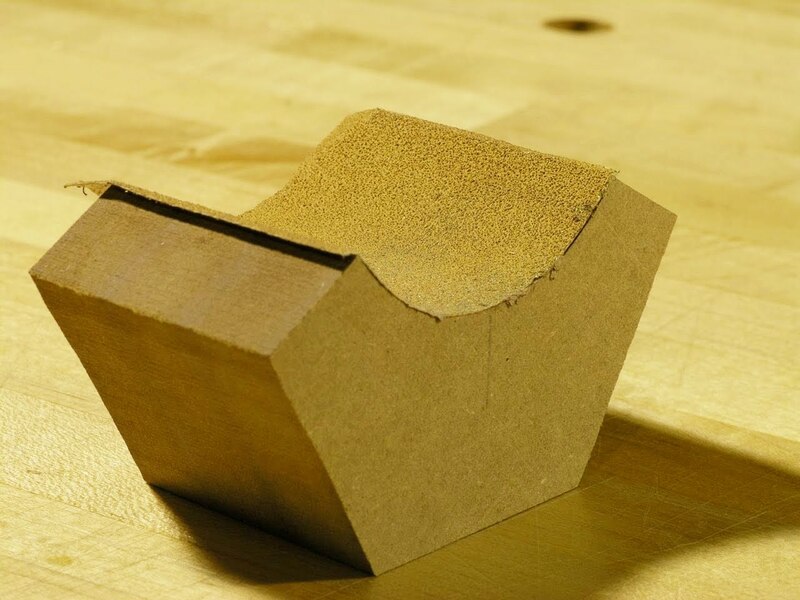 With a 2 1/4" forstner bit I drilled out a piece of MDF and cut it into three 120˚ segments, glued them together creating an arched sanding block that was covered with sandpaper. I figured that the thickness of the sandpaper would make up for the oversized, probably not to complete accuracy but close enough. With some 120 grit 3M Stikit paper on the sanding block I made a few preliminary strokes on each wing to see where the high spots were and the proceeded to work those back with a file, while monitoring the progress carefully. Once the wings were down to the final height I finished it off with witch 220 grit. To finish off the bridge I beveled the two walls that holds the saddle and the tie-block. The outside wall was done first. I Stuck in a piece off wood into the string trough, turned the bridge upside down, which held the bridge at an angle. 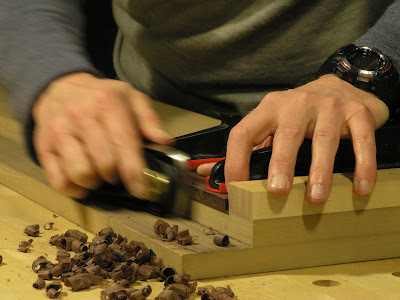 Then the bevel was trimmed back on the shooting board with a block plane. The wall adjacent to the string trough was pared back with a chisel, as was the tiny bevels on the tie-block ends. The bone segments on the side of the tie-block was beveled with the block plane too. For this I made a jig out of plexiglass to locate the bridge placement. I made it 581.5mm long, 580mm scale plus 1.5mm compensation, and 66mm wide, the width at 580mm when following the fingerboard taper. Then a center line was scribed down the length, as was the 12th fret across. Measuring from the center the width of the nut, 46mm, was marked at the nut end and two lines following the taper of the fingerboard was scribes on each side of the jig. 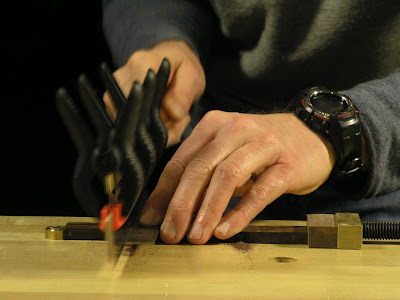 I put rough cut nut in place and butted the jig up against it and clamped it to the fingerboard with two cam-clamps, one above the 1st fret and one above the 9th. 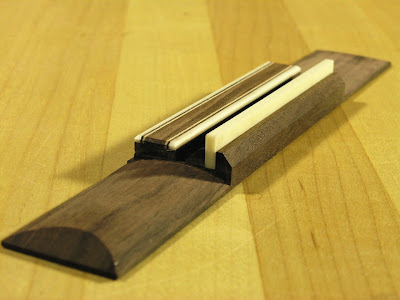 The jig was carefully aligned with the fingerboard having the two scribed outer lines following its taper. With a rough cut saddle in the saddle slot, I was now able to place the bridge in the correct location by butting it up against the jig. That is, I skewed it 1mm toward the bass side in order to have more 'shelf' on the fingerboard on the treble side. To prevent it from sliding out of place during gluing, three layers of blue masking tape was placed up against and around the periphery of the bridge. Then the notched gluing caul with a 25' dome was placed inside the guitar over the fan bracing and the bridge was ready to be glued on. For the actual gluing Titebond was used again. I like Titebond! I made three cauls out of 1/2 plywood to go on top of the bridge. One for middle and one for each of the wings. The two that went on top of the wings had thin lines of cork on the edges to locate the clamping pressure at the edges of the wings. 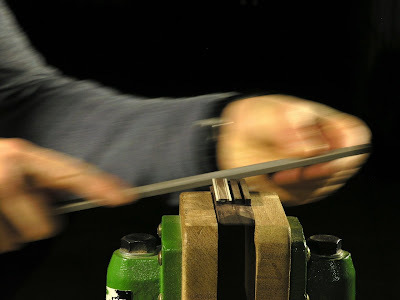 I had bought four fancy bridge clamps from StewMac, but while they seemed to do the job OK, I was somewhat disappointed with them. They seemed very flimsy and wobbly and I would have preferred them to be a little more sturdy. The assembly was left to dry over night.